SCHEDEL -Sexta Etas Mundi. Folio CV - Nuremberg Chronicle. SCHEDEL, Hartmann. - Sexta Etas Mundi. Folio CV - Nuremberg Chronicle. Sexta Etas Mundi. Folio CV - Nuremberg Chronicle. - SCHEDEL, Hartmann. Title : Sexta Etas Mundi. Folio CV - Nuremberg Chronicle. . Size : 17.3 x 11.8 inches. / 44.0 x 30.0 cm. 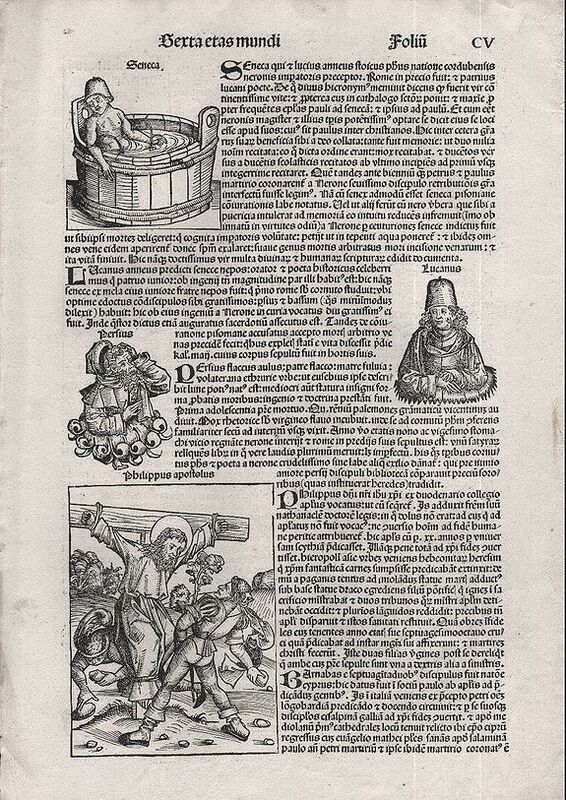 Description :An interesting page from the famous Nuremberg Chronicle: Side one: Seneca murdered in the bath-tub, and the crucifixion of the apostle Philippus, plus two smaller images. Side two: The apostle Bartholomeus being skinned, in the presence of a King plus two smaller images. Condition : Very good condition, with a dark impression.